No, we’re not sure what this is either, but we like primary colours! Clever building techniques have been used in abundance to create whatever this is, and you can place your guesses at Tammo S.’s photostream by clicking here. This TLCB writer is not familiar with the 1990s IMSA Championship. He was watching the brilliant BTCC at the time, being a) 7, and b) the wrong side of an ocean. However by all accounts it looked like an awesome race series. Prototypes were run by privateer and manufacturer teams with variety of engines, including BMW, Chevrolet, Ford, Jaguar, Mazda, Nissan, Porsche, and Toyota, and they were exceedingly fast machines. This is one such car, the 1991-’93 Toyota Eagle MKIII, powered by a tiny yet mighty 2.1litre 4-cylinder turbocharged engine, it won 21 of the 27 races it entered, utterly dominating the series. 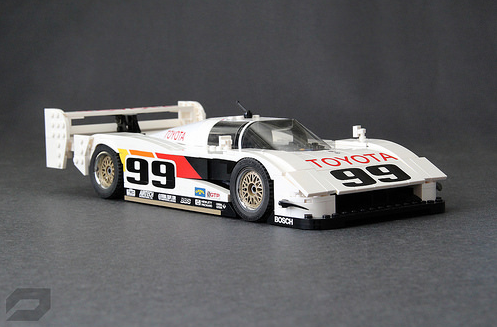 Such dominance and a financial crisis led to the the end of the IMSA GT Championship in the mid-’90s, but not before Dan Gurney’s Toyota team racked up two Championships. 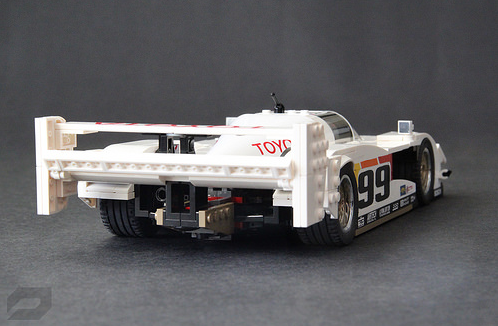 This incredible replica of the Toyota Eagle MKIII is the work of previous bloggee PROTOTYP. 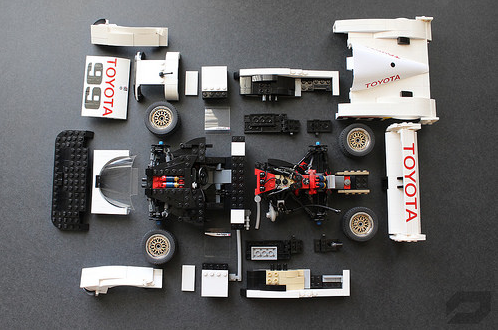 and he’s recreated the championship-winning racing car brilliantly. Built from around 1,000 pieces the engine, suspension, and chassis have all been accurately constructed, whilst the bodywork includes some superbly authentic decals to create the famous livery. 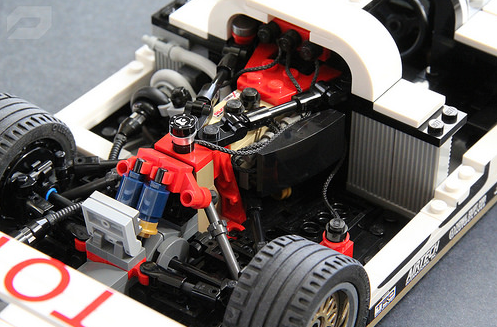 There’s a whole lot more to see, including some stunning photographs of the chassis, suspension and engine detailing, at PROTOTYP.’s Flickr photostream and via the Eurobricks discussion. This instantly recognisable Chevrolet Corvette C7R race car was discovered by one of our Elven workforce on Brickshelf today. It’s been built by gtahelper and it’s a superbly accurate 1:20 scale recreation of the GT3 contender. See more at the Brickshelf album via the link above. It’s time for some history here at TLCB, because we are – at heart – complete nerds. The world’s first purpose-built racetrack (or what’s left of it) lies not far from TLCB Towers. The Brooklands race circuit opened in 1907, built partly for manufacturers of the newly emerging auto-industry to test their cars, and partly because driving really quickly is bloody good fun. Measuring just under 3 miles long the Brooklands track was built from uncoated concrete banking, which in places reached 30ft high, and was simply unimaginably steep, far steeper than any modern banked circuit. With no safety barrier at the top and cars routinely getting airborne over the bumpy concrete the spectacle was incredible, and crowds topped a quarter of a million in the circuit’s hay-day. The outbreak of the First World War saw Brooklands requisitioned by the War Office, as the site also included an aerodrome, becoming the UK’s largest aircraft manufacturing centre by 1918. The end of the war saw motor racing return the the track, alongside the continuation of aircraft manufacturing, but when Hitler decided that Germany hadn’t quite finished with Europe yet motor racing at the track ceased for good. During the Second World War the Brooklands site became the hub of Hawker fighter and Wellington bomber manufacturing, amongst other aircraft, and the track’s survival as a piece of British heritage sadly, but necessarily, came second to the war effort. Trees were planted on the track to disguise it from German bombers, and whole sections ripped up to expand the runways. By the end of the war the track was in a poor state, and the site was sold to Vickers-Armstrong to continue operations as an aircraft factory, at one time laying claim to being the largest aircraft hanger in the world. However as the UK’s aircraft manufacturing industry declined the Brooklands site was gradually sold off, becoming a business park, a supermarket, and the Mercedes-Benz World driving instruction track. Today not much of the original circuit remains, but what does is managed by the Brooklands Museum, who are endeavouring to preserve possibly the most important motor racing, aeronautical and war-time manufacturing site in the world. A recent heritage grant aims to return both the aero-buildings and the famous Finishing Straight to their former glory, and a section of the incredible concrete banking is still standing. You can even take a car on it if you’re feeling brave. If you’re in the UK and you get the chance to visit the Brooklands Museum we highly recommend it, but for our readers further afield you can get an idea of the insanity of the vintage racing that once took place there courtesy of this lovely scene recreating Brooklands circa-1935 by Flickr’s Redfern. There’s more to see of his 1930s Maserati, its racing counterpart, and his wonderfully recreated Brooklands banking his photostream. Click the link above to step back in time. After a few years in some decidedly un-Ferrari-esque positions, Scuderia Ferrari are now back at the sharp end of Formula 1. Whether or not you’re a fan of the prancing horse, it is most definitely a Good Thing that F1 finally has a challenger to Mercedes-AMG. This is the car that has returned Ferrari to the top step of the podium, the beautiful SF70H. With the aero rules relaxed a bit this year F1’s designers finally have a bit more freedom to create some interesting shapes, in doing so adding variety both to the grid and to the race results. The door has barely shut behind Bernie Ecclestone on his way out and the sport is already more interesting. This wonderful Lego replica of the 2017 Scuderia Ferrari Formula 1 car comes from previous bloggee Noah_L, one half of the duo ‘LegoBuilders’, and he’s recreated the complicated aero-channelling shape beautifully in brick form. The car also features removable front and rear wings and engine cover, under which is an accurate V6-Hybrid power-plant. There’s are lots more stunning images to see at the Ferrari SF70H album at Noah’s photostream – make the jump via the link in the text above – and you can see the model on MOCpages by clicking here. This superb recreation of the 1991 Shell-liveried racer comes from Flickr’s Nuno Taborda, and much like the real F40 GT it’s based on the production version, in this case LEGO’s excellent 10248 Creator set. Nuno has upgraded the set’s bodywork and interior to GT specification, and re-liveried the car in Shell’s iconic white, red and yellow sponsorship. There’s lots more to see of Nuno’s 10248 modification at his Flickr photostream – click the link above to go GT racing circa 1991. The money theme continues today with this, newcomer Dugald Cameron’s incredible Aston Martin Vantage GT3 racer. Constructed from many of the parts in LEGO’s 42056 Porsche 911 GT3 set (and putting them to considerably better use), Dugald’s GT3 is a seriously beautiful build. Plus it’s orange, and we like orange. Underneath that retina-searing bodywork is a full remote control drivetrain, with two XL Motors powering the wheels, a Servo controlling the steering (and linked the steering wheel), plus a Medium Motor driving the sequential transmission. A V12 piston engine sits up front, whilst a mechanically adjustable rear wing is mounted at the back, and the cockpit in-between features a fully adjustable driving position with a tilting steering wheel, pedals with feedback, and a sliding racing seat. The suspension on all four corners is fully independent, with torsion and sway bars, plus a trick air-jack system powered by an on-board compressors is fitted to allow for quick pit stops. The complete model is one of the most impressive we’ve seen this year, and the entire build process has been catalogued on both Eurobricks and Flickr, showing both the steps taken to create the Vantage GT3 and the brilliant engineering within it. You can see the full gallery of images at the Aston Martin Vantage GT3 Flickr album, and you can read about the build process by flicking through the Eurobricks discussion that charted it by clicking here. This stunning Mercedes-Benz AMG C63 DTM racing car was discovered on Eurobricks, and it’s one of the most original Technic Supercars we’ve published in ages. Underneath the brilliant bodywork, complete with wonderfully authentic decals, is a wealth of superb mechanical engineering, including a paddle-shift operated 4-speed gearbox, a miniaturised working V8 engine, independent suspension on all wheels, and working steering. Builder Brunojj1 hasn’t stopped there though as he’s constructed a matching AMG C63, replacing the mechanical goodies with a Power Functions remote control drivetrain and LED lights. Drive is delivered by a combination of an XL Motor and an L Motor, geared to match one another, with a Servo powering the steering. There’s loads more to see of both models, including a of each, at the Eurobricks discussion forum. Click the link above to join the race. The finest brick-built livery ever? If not it’s a sure top three. This brilliant Iveco Scuderia Ferrari transporter from the 2008 F1 season is the work of Ryan Link of Flickr, and it has some of the most intricate brick-work we’ve ever seen. The whole truck opens up too, with a double-deck car ramp, sliding tool storage and a flip-up awning. See more via the link above. Only the toughest, most elite* of TLCB Elves is sent foraging in MOCpages nowadays. “Bonk, Smash, Thud” isn’t just the noise of MOCpages breaking again, it’s also the sound of malnourished Elves collapsing with hunger. It’s hard to find good Lego vehicles and get Smarties to eat when the site crashes for so long, so relatively regularly. MOCpages has been the spiritual Lego home for many top quality builders over many years. Sadly, more and more builders have become inactive there and fled to other websites. However, there are still gems to found on the ‘pages. *Fattest actually. The low chance of meal tokens is a good way to sneakily put them on a diet. Not a product of the Morris Garages car builders but a Formula 1 racing car with a body made from lightweight magnesium. This car is yet another fascinating piece of auto-racing history from Greg_998 on Flickr. In the late 1960s Honda saved 80kg from the weight of their previous F1 car by giving its body a magnesium shell, instead of an aluminium one. This author fondly remembers setting fire to strips of magnesium in chemistry lessons, something which is now probably banned under Elf & Safety. Magnesium burns at roughly 3,100°C, making it great for things such as distress flares, sparklers on bonfire night and those things that Boy Scouts start fires with. Tragically these properties make it an incredibly dangerous material to have built a car from if it crashes and catches fire. You can see more images of this unusual car and read a full history by following this link to Greg’s Photostream.